Broccoli Tots are a fun and healthy play on tater tots made with finely chopped broccoli in place of potatoes. When I was pregnant with my second child, I had one major craving that far outshone any of the others. I wanted broccoli. Strangely, I was never a huge fan until then, but pregnancy can do some pretty wacky things to a woman. And my pregnancy made me a broccoli loving fool. I'm happy to say that my love for broccoli continued even after my son was born, which I couldn't be happier about. There are SO many ways to enjoy it! I love to roast it in the oven until it's all golden and crispy. Drool. Or how about Broccoli Cheese Soup! Mmmmmm...doesn't everyone love creamy broccoli cheese soup? I know I do. I even like to eat broccoli stems raw, like in my Asian Broccoli Stalk Salad. Yum, yum, and yum. 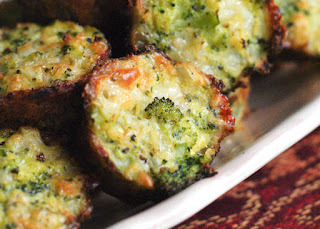 I decided I'd give Broccoli Tots a go, seeing as Zucchini Tots are super popular on the blog and I thought they'd be great with broccoli instead of zucchini. I was right! I had to stop myself from eating the whole plate. The process of making them is really simple. Just a few simple ingredients, a few simple steps, and a quick cook in the oven. I'd say that the most important part about making these is to make sure you get as much liquid out of the broccoli as possible before mixing it with the other ingredients. If not, they'll just fall apart and turn out soggy. Still tasty, but not as good as when they get that little bit of crisp on the outside. 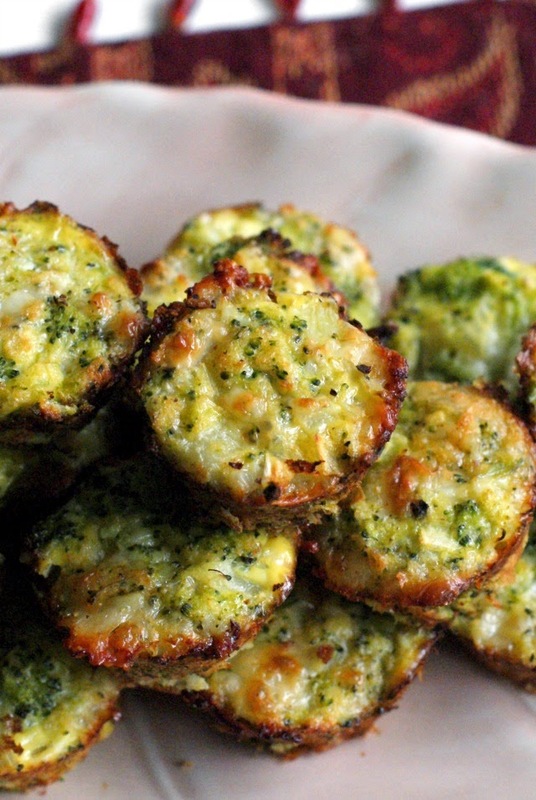 These little bite-sized broccoli tots would be great served as a size dish alongside Homemade Crunchy Baked Fish Sticks or Oven Fried Panko Crusted Chicken Drumsticks. It think they'd even be great as an appetizer! Looking for more inspiration? 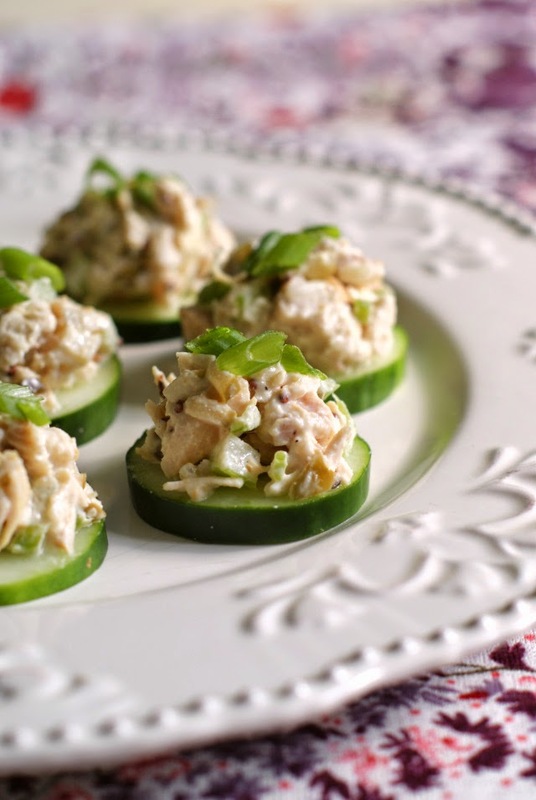 Here are a few more fun appetizer recipes from the archives for you to check out! If you're a broccoli lover like me, or if you've been looking for more ways to prepare this good for you cruciferous vegetable, you've got to try these yummy Broccoli Tots! 2. Pour 1 inch of water into a saucepan; bring to a boil. Place the broccoli into the boiling water, cover, and reduce the heat to medium. Cook the broccoli for 5-6 minutes, or until it can easily be pierced by a fork. Drain the broccoli and set aside to cool slightly. 3. Lay the broccoli out onto paper towels and cover with more paper towels, Press down firmly on the broccoli to absorb as much moisture as you can. Another method is to put the broccoli in the center of a dish towel and ring out the water as seen here. Finely chop the broccoli. 4. In a large bowl, combine all of the ingredients and season with salt and pepper. Stir everything together until well mixed. Fill each muffin cup in a mini muffin tin to the top, pushing down on the filling with your spoon so it's nice and compacted. 5. Bake for 18-20 minutes in preheated oven. The top will be starting to golden. To easily remove from the pan (without scratching it to death), run a plastic knife around the edges of each tot and they should come out easier. If they seem to be falling apart when you take them out of the pan you can (1) put them back into the oven to cook for a few minutes longer so they are a bit crisper or (2) let them sit in the pan for a few minutes to let the insides firm up a bit before removing them from the pan. You have to be ginger with them if they're sticking a little to the pan! OMG - SWOON!!! I was thinking of using a steamer basket to avoid the sogginess. What do you think? Making these this weekend for sure! Thanks! Oh, for sure. The broccoli should be cooked until just tender and bright green. I would have used a steamer basket if I had one, so totally use it! I don't have a muffin tin. Do you think there is another way to cook them? Do you think a salad spinner would work to get most of the moisture out instead of laying it on paper towels? Hmmmm, not sure. I've never done it that way. Let me know if you try it! When I calculated it I got 232 calories for 6 mini tots. whats the carbs on this?? Hi Becky...how many calories do you think would be if you made them in a regular muffin tin? What happens if you use a regular muffin/cupcake pan? That should work. You'd just have to up the cooking time to make sure they're cooked through. I don't see why not. I'd heat them in the oven at 325 until they're heated through. Do you think frozen broccoli would work as well? I haven't tried it. I would think that the moisture level of the frozen broccoli might make them too wet, but I'm really not sure. Let me know if you try it! Raw broccoli works great! Also you don't have to spray if you use non stick mini pan...You can also flip after 10 min to brown both sides.Found they need some spice ...maybe cayenne pepper or horseradish etc Great recipe Becky. I'll have to try it with raw broccoli. Thanks for the suggestion! 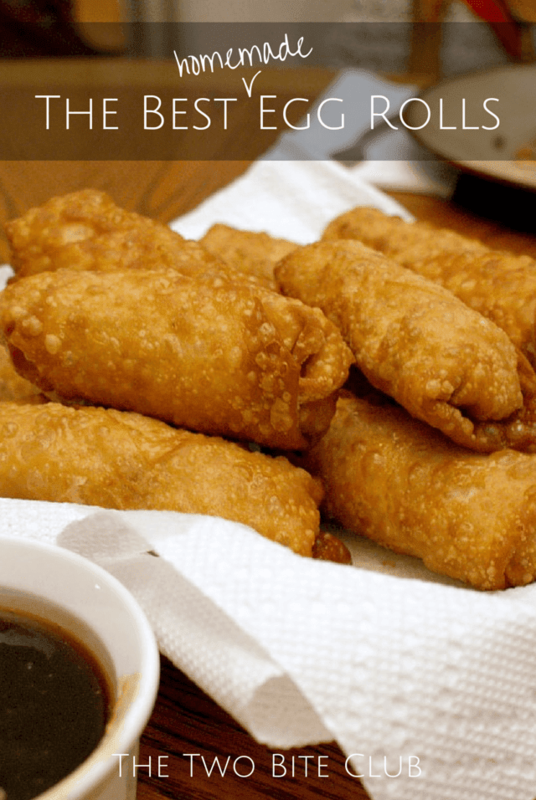 I am definitely going to make these but was thinking to chop some hot pepper into them to up the ante on them. I always like a little heat with my food. 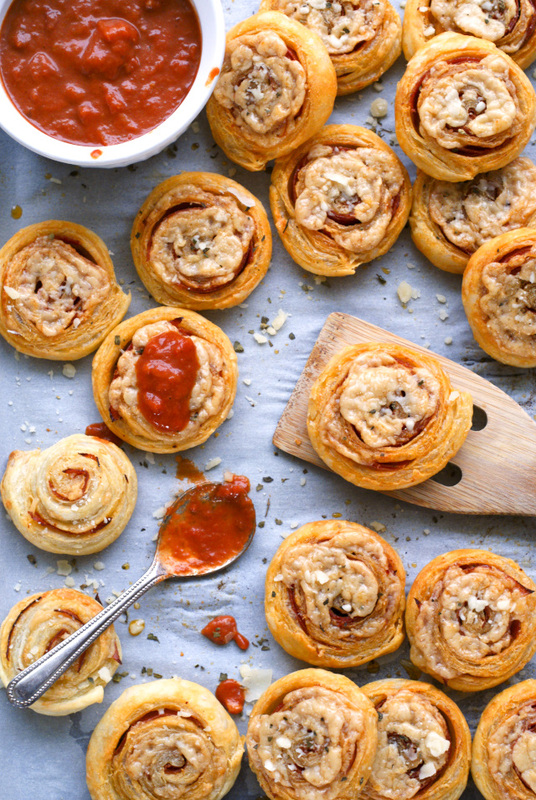 These just look too good to be true, and would also use them as an hors'durv at a party. I forgot to steam the broccoli in the microwave and used chopped, raw broccoli. Even quicker! What do you think about cornflakes instead of breadcrumbs? I think that it would work if you crush them up real good! Let me know how it works if you try it! I had a big bag of frozen broccoli florets in my freezer, so I defrosted/steamed in the microwave, and followed your steps to squeeze out the liquid and it worked out great! I also didn't have bread crumbs, so I used 1/4 cup of oat flour & a sprinkle of baking powder. Also I don't have a mini muffin tin (I apologize for all these substitutions/deficiencies, clearly I am a student) so I used a regular tin, filled halfway, pressed down with a spoon and reduced the oven temp to 375. Awesome recipe! Can you sub anything for the eggs? My sister uses flax seed to substitute for eggs. I'm not sure of the technique but it involves soaking the seeds until they gel. I've never tried them without eggs or using a substitute. The eggs work as a binder. I have heard of flax eggs, but I've never gone that route, so I'm not sure! 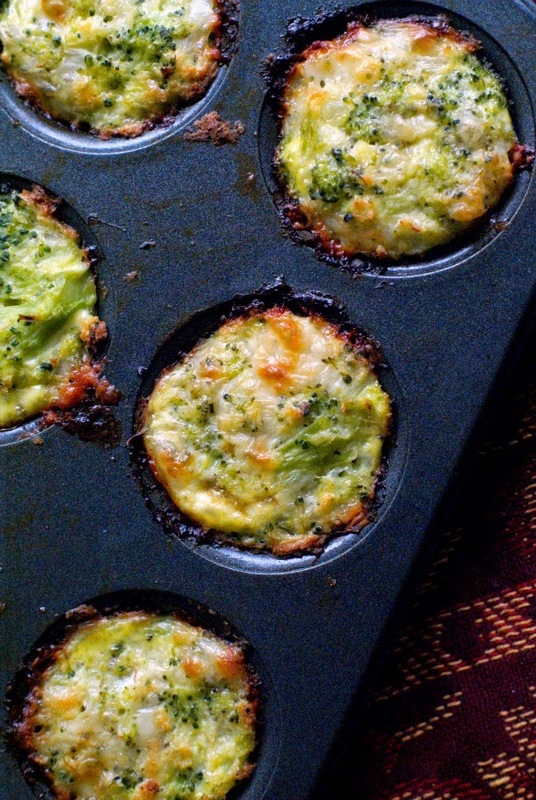 I am always on the lookout for new ways to cook broccoli and these look absolutely delish -- and so easy!! I definitely will be making these later this week. This looks so yummy! I'm going to make it tonight but I'm going to use panko instead of regular breadcrumbs. I find that panko makes for more crunch! Hoping my 18 month old, who loathes broccoli, will give it a shot! I love panko. Great idea! Awesome! Great to know the gluten-free route worked out for you. Have you ever tried using hashbrowns with this? im going to have to try these for sure . have you tried with cauliflower? Not yet, but it's on my must try list! My son and I can not have gluten or dairy. I can substitute crushed pork rinds for the breadcrumbs, but was wondering about the cheese. Do they still come out well without it, or do you know of a good dairy free alternative? The veggie cheese I've seen at our grocery store still contains whey (which seems to defeat the purpose of buying fake cheese), so I can't use that. Hmmm, not sure about the cheese. I haven't tried and veggie cheese and I've never tried to substitute anything for the cheese for this recipe. I think the pork rinds would work though! Can shredded russet potatoes be added without any other adjustments? I've never tried this recipe with shredded potatoes, but I think it would work! The bottoms stuck to the pan. Could you add a little amount of breadcrumbs to the mix to soak up any untrained water? I love Broccoli and Danish Blue cheese soup. It's delicious. Broccoli tossed in olive like and Garlic with a squeeze of lemon...yummy. I would use frozen broccoli. You do not need to cook the broccoli first. 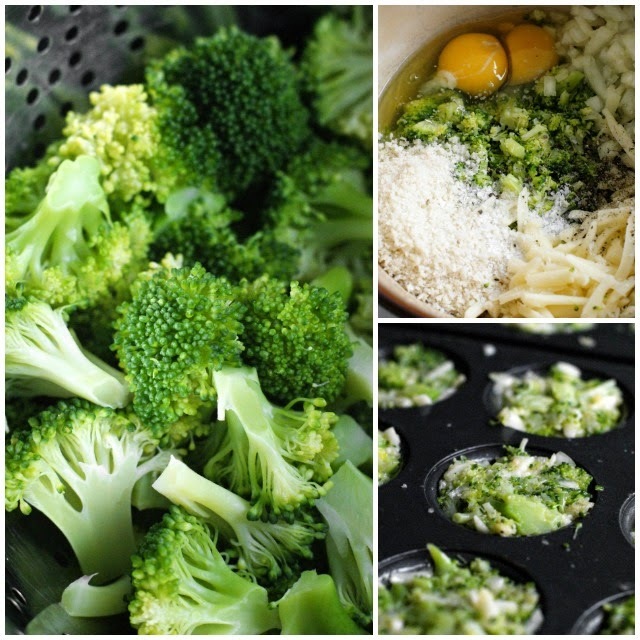 Cooking while baking is enough; boiling/steaming before baking destroys lots of the nutrients in the broccoli. I did not cook them before baking the tots and they were fine. Could also use zucchini (shredded) and pat dry in a paper towel. A "head of broccoli" can vary in size..any idea in ounces or cups? 3-4 cups, depending on the size of your head of broccoli. I did not have a "head of broccoli:...in fact I do not think I even had half of a head. I just guessed at the amount of cheese, onions etc to use. I used my gluten free bread crumbs and one egg. It was enough for a small mini muffin tin (12). It turned out delicious inspite of the fact that I did not add enough salt. Hi - these look AWESOME! have you tried baking and freezing them? I'm a fan of making A LOT and then having freezer meals (working mom). let me know - thanks!! Hi, Mindy! I haven't tried freezing them yet. If you try it, let me know how it turns out! Yes they do freeze well. There's just my husband and I so I always freeze them to have ready for a quick snack. Great size for our little grandsons too. This sounds fantastic! Any suggestions about a paleo version? Almond crumbs, haha? do you think chopped spinach would work as well? If so, would the rest of the ingredients be the same??? How do you prepare zucchini to use in this rather than broccoli? 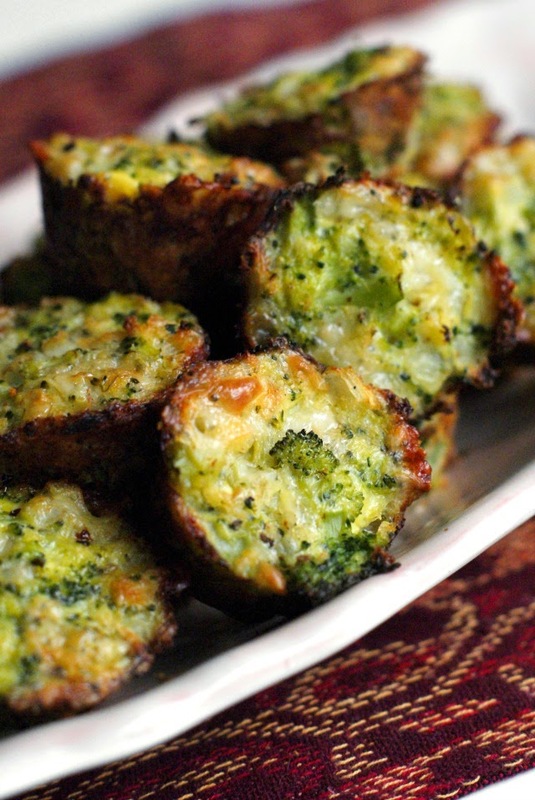 I clicked on zucchini tots and the broccoli came up again!! Just had these for dinner with my grandkids--so far most are refusing to even try them--but my 3 yr grandson LOVES them!!!!! This recipe is wonderful! I've had the recipe for 8 days and I've eaten 3lbs of broccoli already! 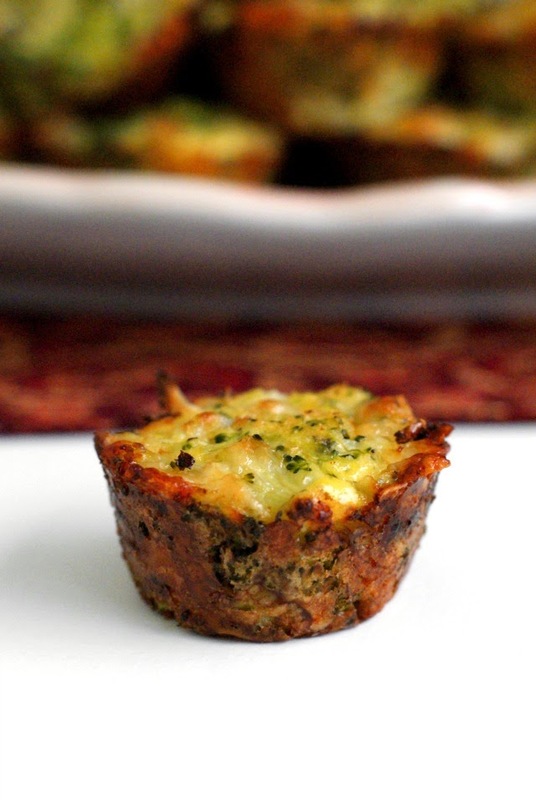 They're like mini-quiches. Quick to mix up, and quick to cook. I've mixed half broccoli and half carrots and it turned out delicious, too. These are now our favorite snack and I'm wanting to keep some of this mix in the fridge all the time. I'm going to try out other veggies, too. Zucchini definitely. Maybe okra. Thanks for sharing! Love them! Chopped frozen spinach that has been thawed and completely drained will work, too! Keep the recipes and pics coming...delicious! I actually cooked my broccoli with onions on the stove in a tiny bit of oil. This way you don't have to worry about the water and it gives the broccoli a little flavor. These are delish. The second time I made them, I lightly sprayed the muffin pan with cooking spray. The tots came out easily by just running the knife around once and they were browner and crispier on the outside. Thanks for sharing this recipe. I used frozen broccoli and they came out great! These came out really good. I sautéed the onions/ bell peppers. I made sure the broccoli was dried and then I put it in the blender because I don't like broccoli's texture. Thank you for sharing. I don't like broccoli but these are really good. Think I'll add some bacon! Bacon!You're the first to mention adding bacon which is what I'm gonna do. These are delicious! Thanks so much for the recipe :-) I also added some red and yellow capsicum an patted the moisture out of them and it turned out great! Very tasty. I think you could omit the onion with no problems. I always omit the onion. Still delicious! I did steam broccoli, worked great. I sprayed muffin cups, full size and sprinkled cheese on top. Since I sprayed cups they got slight crisp around edges and came out fine. They are delicious, thanks for recipe! Loved them as is written. Then I started playing. tried dehydrated onion flakes added a lil curry powder. Everyone loved. Also tried with a little garlic powder. Everyone's second favorite choice. Great recipe as is and also fun to play around with! Would you refrigerate or leave out in room temp? I eat them warm or at room temperature and store in the refrigerator. I do love roasted broccoli. I'm glad to hear it still turned out well with your modifications! What could be used to replace the breadcrumbs? I've never substituted them before, so I'm not sure. Maybe crushed pork rinds? Frozen broccoli works great! My family loves these! Very easy to make. I'm glad your family loves them! Just made it, LOVE it! Thanks for sharing it Becky. I am on a very low salt diet for medical reasons. I can't have more than 2 grams of salt/sodium per day. I normally use a salt substitute for all cooking that says salt. Are you sure with the salt, breadcrumbs, cheese and other ingredients that this recipe has less than 300 mg of sodium per serving? Do you think that fresh broccoli "rice" would work just as well? Then you wouldn't have to deal with the moisture issue or trying to cut the broccoli into small even pieces. I found them a little bland but love the concept. I think adding some spice like basil or thyme would add a little more flavor. i used cauliflower simply because I had it on hand. I definitely would use more cheese next time, definitely. I would also increase the onion but that's to suit my taste. other than that, easy to make. I had no problem with it not sticking together. because I only used approx. 11/2 cups cauliflower, I only used 2 eggs. I also used nonstick mini muffin pans so they came out with no problem. definitely needs salt. Found it on Yummly..i was worried there wouldnt be enough bread crumbs and eggs but they actually turned out delicious. Thank you! Do you think quinoa would work for bread crumbs. Extra protein and fewer carbs would be good. Maybe I'll try. Tasted great but they were really hard to get out of the pan even though I greased them. I tried every utensil I could think of but they still broke up a bit. I think next time I would use a 9x12 pan and line with parchment paper and cut into squares.